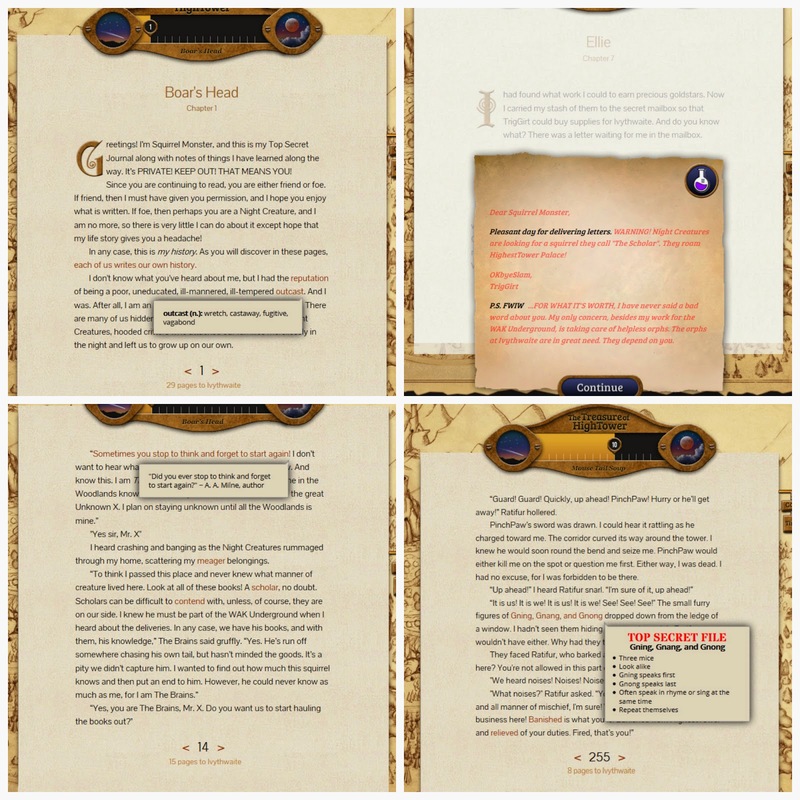 The kids were asked by Star Toaster to review The Treasure of HighTower, the first book in their online adventure series Orphs of the Woodlands. To sum up Orphs of the Woodlands: it's a book, it's a game, it encourages positive values, and it's a multi-subject learning tool. And it's up there as one of our favorite review products EVER. This program is all about the child (hereafter referred to as "he", though this program has been created for both boys and girls, I just happen to have three boys using it, so went with "he"). He begins by filling out an application to become a spy. The name he enters will become his name throughout the story, because this book is about him. 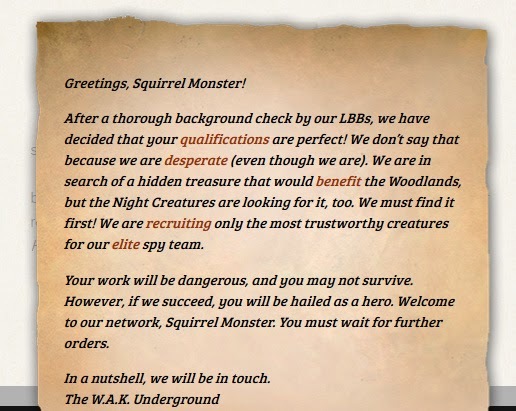 The spy company, WAK., is a little short on spies so he is hired for this dangerous, unpaid position. Oh, and he's a gray squirrel and an orph. *The images I'm using are from River's account, his user name is "Monster", hence "Squirrel Monster". As the child begins reading he'll discover a whole new world, filled with a wide variety of woodland creatures, adventures, friends, spies, enemies, and excitement. He'll care for orphs, orphaned little animals who need help (he's one himself) and Ivythwaite, his childhood home and home to the orphs he's caring for, and he'll travel to the city of HighTower and HighestTower Palace to find treasure. 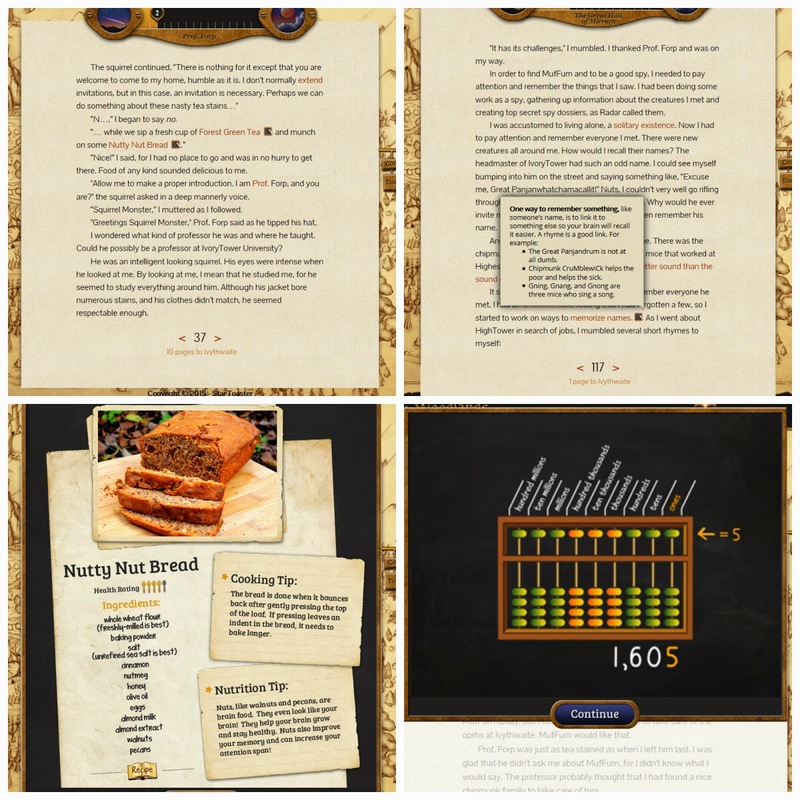 Throughout the pages of the book are interactive bits and pieces. Words may be in red print instead of black - some of these are challenging words that can be hovered over for definitions, some may be "Top Secret Files" that will give a little more information about the name in red, some are famous quotes and the author they're attributed to, and so on. 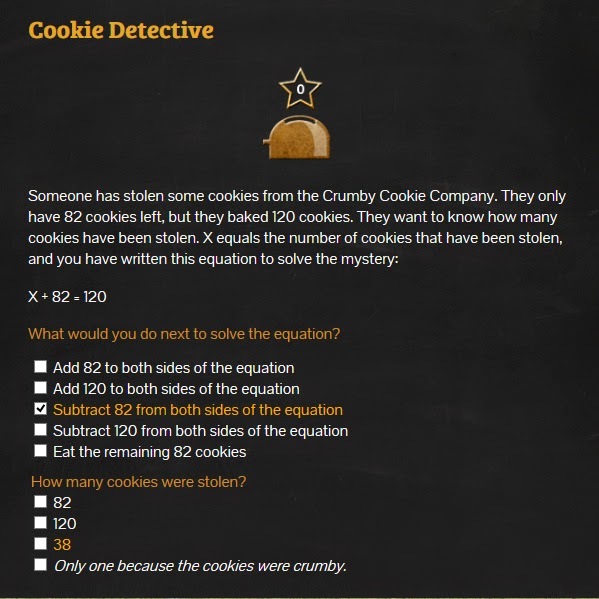 Occasionally, the child will come across a blackboard, clicking on the blackboard will teach the child information, often a two-three minute lesson by Prof. Forp, his very smart, messy mentor, who teaches him in exchange for cleaning and Latin lessons (yup, even Latin is thrown into this game!). There are also letters written to the child that must be read. Most of the words in these letters are hidden and the child needs to remember Prof. Forp's lesson about acids and bases to make the invisible ink show, once the ink shows the really important messages appear! At the end of each chapter the child earns goldstars to support the orphs he's caring for at Ivythwaite. If he doesn't earn enough money to care for the orphs they'll disappear from Ivythwaite. To earn goldstars he must work. Here's where the educational aspect of the program really comes into play. The child will choose jobs from a variety of subjects, some of which are art, math, science, vocabulary, and much more. 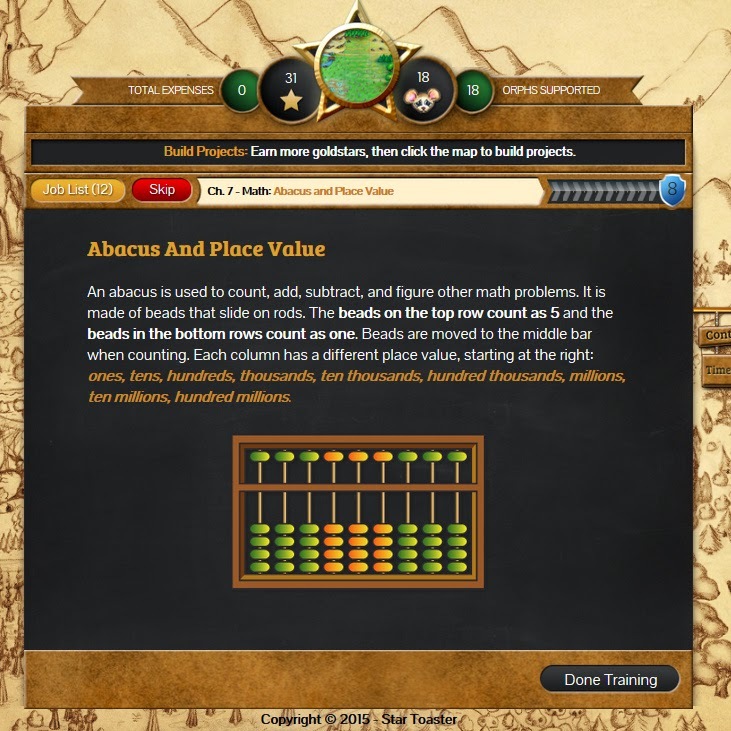 Jobs in math might focus on mean, estimating the height of a tree, angles, or area. Thinking skills jobs usually pull information from the previous chapter, so skipping big paragraphs will leave the child at a disadvantage! To do a job the child first does a lesson, usually either a short written explanation or a video of one of Prof. Forp's lessons. Prof. Forp might be my favorite character in the book because he's entertaining and he starts every lesson by saying, "As I've told you before, I never repeat myself, so pay attention." After the lesson the student answers a question. The answers aren't super tricky, and usually one or two of the multiple choice answers are silly enough to be eliminated immediately, like "I wasn't paying attention. Who is PinchPaw? ", creating a fun environment, not a super stressful "test" feeling. If the child gets the answer right he earns goldstars to care for his orphs. If he gets an answer wrong he moves on without earning points, it's not the end of the world! After getting enough correct answers in a category he'll be "promoted" and will earn more gold stars for each correct answer in that category. At the top of the Jobs/Help Wanted page is information on how many orphs the child is caring for, how many goldstars he needs to care for those orphs, and how many goldstars he's earned. After doing all the jobs available, or at least enough to care for the orphs in his care (any remaining jobs can be done after the next chapter), the child works on his settlement at Ivythwaite. 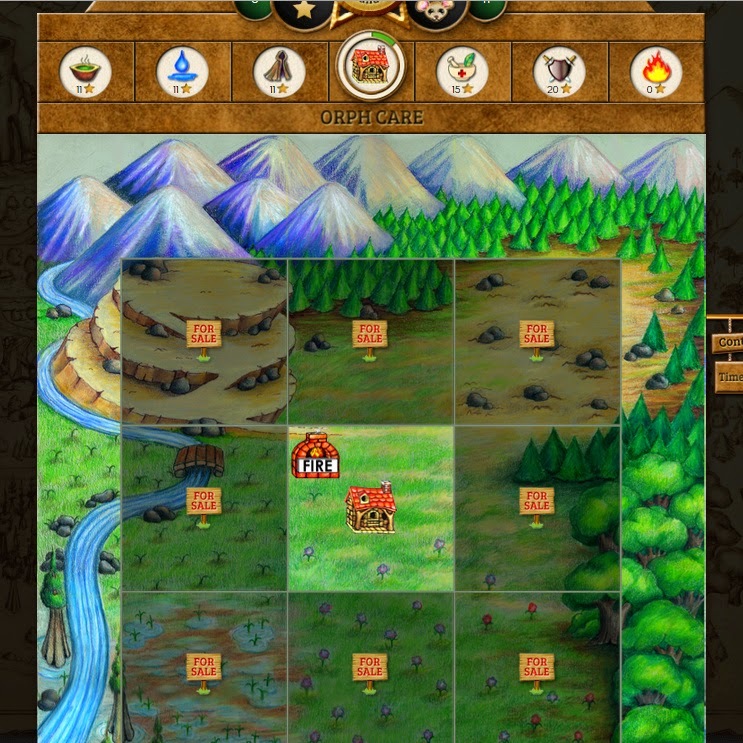 Here he can use any remaining goldstars he's earned to buy more land for the orphs, buy more housing, or add things to the settlement to reduce the cost of caring for the orphs. He'll have to strategize a bit as he decides what to spend his goldstars on. When he's done at Ivythwaite he reads the next chapter. At the end of the chapter he'll have a few more orphs to care for and will need to do jobs again to support all of his orphs. 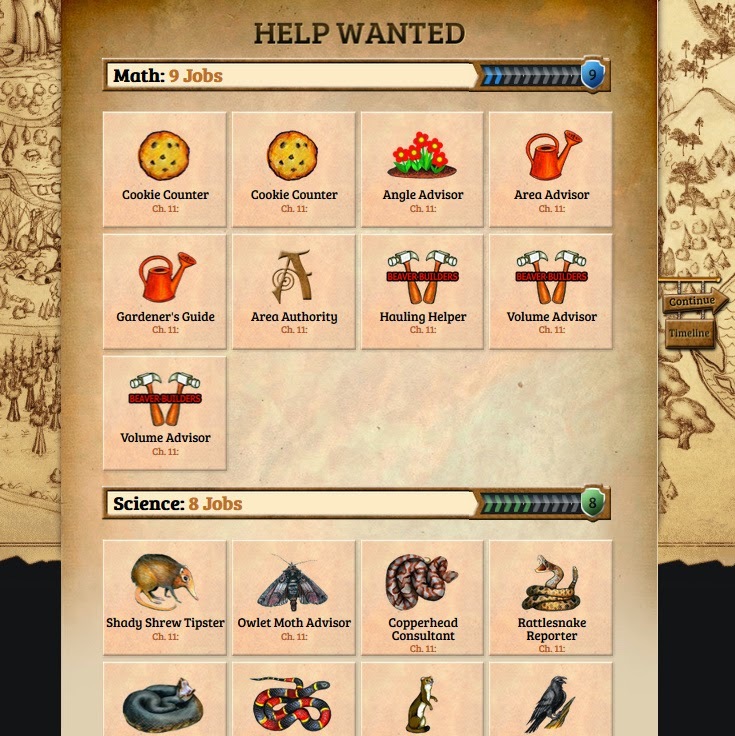 There are new jobs to complete for each new chapter, focusing on skills earned in the most recent chapter will reviewing skills already learned. Could the child skip the jobs altogether? I think so, but then he'd lose all his orphs, which wouldn't be good because (1) he's an orph too and understands that these creatures need care and (2) he made a promise to his tiny chipmunk orph friend Muffum to help orphs. Could the child skip the book and just do the jobs? He could rush through the pages, but the pages are short and full of adventure! So much happens that I don't think he'd want to miss any of it. Truly, there's so much action and adventure that even my more reluctant reader was excited to make his way through the book. 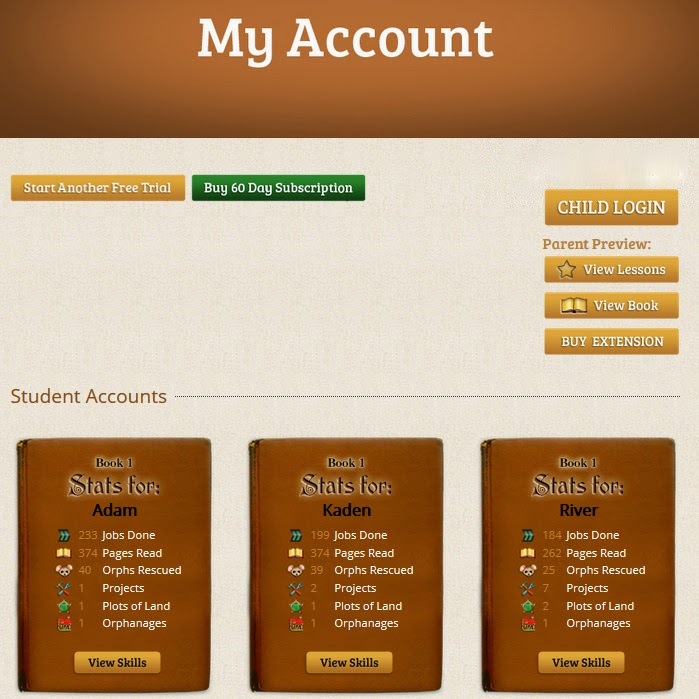 The parent has their own account for this program. It doesn't have the game (I know ... bummer!) but does allow the parent to see how the child is doing. The parent can see where the child is in the book, how many orphs he's got, and all sorts of other useful information. The parent can also see which jobs (questions) the child didn't earn, in case they want to go over any and review them with the child. 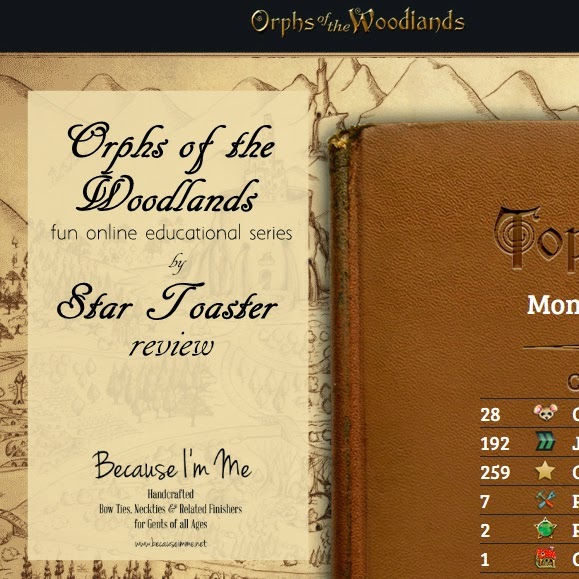 Star Toaster created the Orphs of the Woodlands adventure for kids in 4th through 7th grade, but I think there's a lot of flexibility there. River is 6, initially he and I read through it together but he started working on his own and was on Chapter 4 in no time. There are words that are very big to him, but he was sounding them out and getting through them. He loves Prof. Forp's videos - I'm pretty sure he'd be happy to have Prof. Forp be his primary teacher. Adam and Kaden dove right into this. I think Kaden completed the entire book and most jobs in a few days. Adam took closer to a month to get through the entire program. They did learn a lot of new vocabulary words, much of the rest of the information was review for them (they're in 7th and 8th grades right now). I probably had a harder time figuring this out than the kids did. It just doesn't come to me instinctively, thankfully there are very helpful videos under the "help" section. Each one only takes a few minutes and explains the program very well and very clearly. I hope I've peaked your curiosity and interest in Orphs of the Woodlands, because if it isn't clear yet, we've really enjoyed the program. It's available at Star Toaster for $19.99 for a 60 day subscription for up to three kids AND a 100 page FREE TRIAL is available as well.